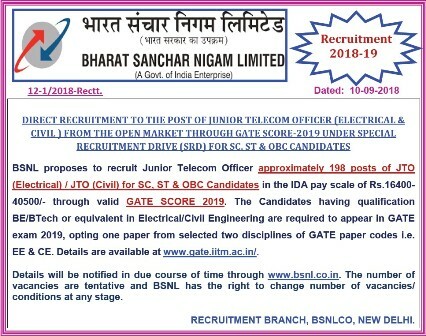 BSNL JTO Recruitment Through GATE Score: BSNL has officially released an advertisement for the recruitment of Junior Telecom Officer (JTO) through GATE score 2019. As per the Advt 12-1/2018-Rectt, eligible candidates can apply for the posts. Candidates from Electrical and Civil background are eligible to apply for the BSNL JTO Recruitment Through GATE 2019. Also, The BSNL has mentioned 198 jobs in the recruitment notification. As we all know that BSNL is a PSU undertaking of Government of India headquartered in New Delhi. It is one of the largest telecom service provider in India. Every GATE exam aspirant for Electrical, Computers, Electronics, and Civil subjects shows interest in working with BSNL (Bharat Sanchar Nigam Limited). Soon after completing your GATE entrance exam, candidates compete for PSU's like BSNL for high-level jobs. To fulfill such people dreams, BSNL has released a job advertisement. Check the details before applying for the BSNL JTO Recruitment through GATE 2019 score. Let's have a look into the BSNL Junior Telecom Officer Jobs Overview. These jobs have immense respect in society, moreover, these jobs are central government jobs. So, GATE aspirant with respective disciplines shows interest here. B.E/ B.Tech or equivalent in Electrical / Civil Engineering are eligible to apply. Candidates registering for BSNL JTO jobs have to satisfy particular eligibility criteria. Check the below points before online application for BSNL JTO jobs. Applying candidates should have B.E/ B.Tech or Equivalent degree in Electrical or Civil Engineering Disciplines. Candidates should attempt GATE 2019 Exam. A valid qualifying score is required to apply for BSNL JTO Recruitment Through GATE 2019. Candidates who have valid GATE score are called for the Interview and Group Discussion on the dates mentioned in the notification. The Notification for the complete details of BSNL Recruitment Through GATE 2019 will be uploaded soon here. Visit the site regularly or subscribe to our Email channel for more updates. Eligible can candidates can start applying for the JTO jobs from 11th February 2019. Check the below link for the Official Advt.